There’s hardly a more ubiquitous image of a newborn baby than that of one wrapped up in a swaddling blanket with just the tiny head and face visible. With a history dating back some 4,000 years to ancient Crete, swaddling has been both in and out of fashion and favor over the generations and through various cultures. Its practice was even documented hundreds of years ago. While today its purpose is often linked to a safe and secure feeling for the baby, back then the idea was that it would allow the newborn’s limbs to grow straight. Somewhere in the 17th century, popular and medical opinion of swaddling began to shift, as it was associated with the idea of mothers leaving the baby unattended and ignored, and often in the care of wet-nurses. Now days however, more and more parents are turning to swaddling as a means of soothing and comforting their babies. In the 1990’s when cases of SIDS were on the rise, the practice of placing babies on their stomachs began to fade in popularity, and swaddling reemerged as the chief means of getting newborn babies to sleep on their backs, thus reducing the risk of SIDS. Some studies have even found that for babies that are placed to sleep on their backs, those that are swaddled are able to stay asleep longer. This is due to most babies waking themselves up with their own startle reflex. Most hospitals will even give you a swaddling class before you bring your baby home, so you know the proper way to do it. This can be important since improper swaddling can increase some risks, but they are easily avoided by sticking to some very basic guidelines. Overly heavy or bulky swaddling blankets can cause overheating, so its usually best to stick to swaddling blankets that are designed for this purpose. Additionally, swaddled babies can develop hip dysplasia if they are wrapped or bound to tightly around the hips. This means that by binding the swaddling tightly around the hip area, the soft cartilage in the hip socket could become damaged and the joints loosened. While dysplasia can be pretty common in newborns, your baby’s doctor will likely check for this at regular check-ups, just be sure to disclose whether it is common in your family or your baby was breached, as these things can increase the risk of hip dysplasia. Also, if your baby is a girl, their chances are already slightly higher. In order to reduce this risk however, just ensure that the swaddling is loose around the hip area and that your baby is able to move their legs and bend them up and away from the body. Since swaddling is usually mostly effective for newborn babies, around the time that your little one is 1 month old, you may want to consider stopping swaddling in the hours that he or she is awake. 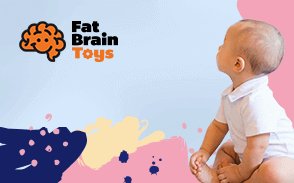 That way your baby’s mobility development isn’t hampered. You may still elect to swaddle them at night however, especially if they seem to sleep better swaddled. Either way, the American Academy of Pediatrics suggests that you end swaddling at the 2-month-old point, or prior to them learning to roll over, whichever comes first. This will prevent them from getting frustrated or even worse, rolling over and not being able to keep their head up. 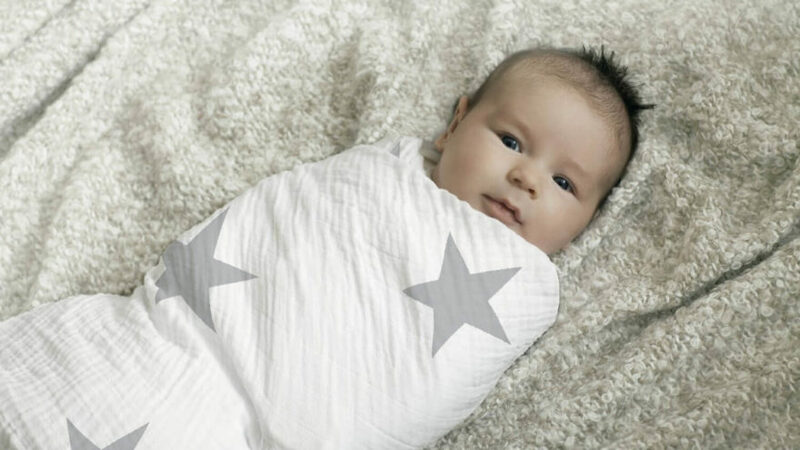 If you decide that your baby responds well to swaddling, there are a number of pre-made swaddling blankets made specifically for this purpose. Some of them include Velcro fastenings, and some are even shaped in swaddling ready shapes, such as T’s. These aren’t a necessity of course, and you can use any thin, square blanket to swaddle your baby by following just a few simple steps. Assuming that you’re using a simple, square baby blanket, start by laying it down so that it creates a diamond shape. Then, take the top corner and fold it downwards towards the center of the blanket. Now, the top should be a straight horizontal line. Next, lay your baby on the open blanket so that his or her lower neck is in line with the horizontal line at the top. That means that their entire body, minus the neck and head, are laying on the blanket. You want to be careful not to have the blanket touch your baby’s cheek, since that could trigger their feeding reflex and they are likely to get upset at the fact that they are not being fed. Now that your baby is laid down on the blanket, take his or her left arm and place it at their side. If their arm is bent across their body, they’re going to be able to squirm and loosen the swaddle. Once you have their left arm placed at their left side, take the left edge of the blanket and pull it snuggly across their body and tuck it under their right side. You want to be sure that it is snug and not overly tight. Now that the left side of the blanket is tucked securely under the baby’s right side, you’re going to bring the bottom corner of the blanket upwards and tuck it into the blanket at the baby’s right shoulder. You want to be sure and leave the blanket loose at the baby’s feet so they are able to move their legs somewhat freely. Now that the left side has been brought over to the right, and the bottom has been brought up, you can tuck the right side of the blanket underneath the baby on his or her left side. Again, you want to be sure to straighten the baby’s arm at their side so that it isn’t bent over the front of their body. Also, be sure that the blanket is tucked securely under the baby and doesn’t loosen or unravel easily. Some suggest that if the blanket is loose, you can simply place a piece of tape there. You probably want to avoid any safety pins being under the baby in this case, and I suggest that if you opt not to use tape but still have a loose wrap, just start over or select a bigger sized blanket to use. What if My Baby Doesn’t Like to Be Swaddled? So, what if it seems like your baby doesn’t like to be swaddled? Well, it might appear that way at first. When babies are inside their mommy’s belly, their hands are typically rested up towards their face, so the experience of having them at their side might be a little frustrating for them at first. It’s important to start swaddling your baby as soon as possible, the longer you wait to try it, the less likely you are to be successful. If they seem to not want their arms down at their sides, just apply gentle and even pressure for a little bit and they will relax and allow them to rest at their side. Some baby’s may initially resist any swaddling, especially if they are a fussy baby. After you have them in the swaddle, you can calm them with other techniques at first, such as rocking, and shushing them. After a little while, swaddling will become associated to them with replacing and security. As your baby grows, their need for a swaddle, (it’s its practicality) will decrease. As they start trying to roll over more and move their arms more freely, it could be time to start reducing their swaddling time. First, start by only swaddling them at night or when you put them down for a nap. If they are alert and restless, swaddling could lead to a lot of frustration on their part. After you have decided to wean them off of the swaddle, start by swaddling them with one of their arms kept out of the swaddle. If you find that your baby gets fussier or doesn’t sleep as well, it could mean that they aren’t ready to stop swaddling. If, however, they are still sleeping well with one arm free, try letting the other arm out of the swaddle while they sleep. Once they start to move around more, and especially roll over, its time to stop swaddling altogether. You want to avoid an instance where your baby is able to free themselves from the swaddle or roll over. Loose blankets in your baby’s crib increases the risk of SIDS. Swaddling is like a lot of things concerning newborn babies; Just because something works for some people doesn’t necessarily mean that it’s going to work for your baby. Don’t get discouraged however by difficulty in the beginning. Anything new and different for your baby is likely to result in them being a little extra fussy and frustrated. If you find that your baby responds well to swaddling, you can look into getting swaddling blankets made for the task, or just keep using small baby blankets. If they sleep better or just fine without it, don’t stress, not all babies are built the same way, and that’s a good thing!